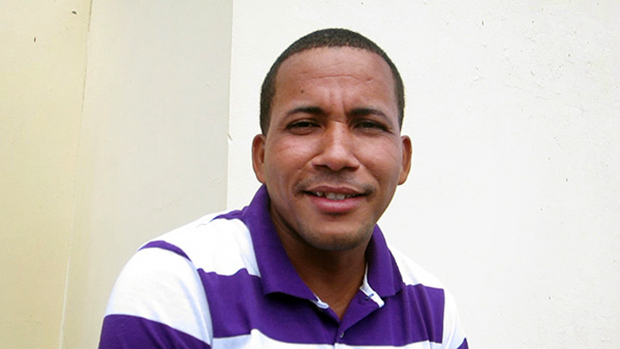 Alfredo Felix is a peer counselor with the Department of HIV at Jaime Mota Regional Hospital in Barahona, Dominican Republic. “I’ve always felt motivated to work in the community to inform people,” he says. The area shares a border with Haiti and has a large immigrant population at risk for HIV. Peer counselors like Alfredo play an important role in countering the effects of stigma, which can make it hard for people to seek information about HIV and follow through with treatment. Alfredo tells a story about someone he helped:"There was a patient who was a bit fragile and came in for his consultation, and we tried to educate him about his health condition. Later the patient returned home, and we lost contact with him. I thought to go out to the countryside, and there I was able to contact the patient and speak with him. I insisted that he come back to the health center. When he did return, he was even more fragile, and we worked with him again, educating him and getting him on medication. Now, the patient is better, he’s stronger, and is thankful for the work [that we do]. "Alfredo recently took part in a workshop to improve the quality of services to eliminate mother-to-child transmission of HIV and congenital syphilis. The workshop was designed and delivered by the Directorate of STI/HIV/AIDS (DIGECITSS) and the health services network (REDES) along with CapacityPlus. Alfredo called it “very important, because it’s intended to improve the quality of services that are offered, to train good human resources [for health], so that these human resources—by being trained and empowered—provide better services for the community. ”The workshop has since been replicated in seven out of the nine health regions in the country and reached over 200 health workers. CapacityPlus provides assistance to the Ministry of Health to improve the human resources management systems that will strengthen the health workforce needed to contribute to an AIDS-free generation and the country's goals to reduce mother-to-child transmission of HIV to 2% or less and the incidence of congenital syphilis to 0.5 cases per 1,000 live births or less by 2015. The ministry’s efforts have already led to improved access to health services through increased availability of skilled health workers, the elimination of traditional user fees, and an increase in national health insurance members receiving subsidized care. Alfredo’s region received an influx of 234 new health workers, resulting in a 500% increase in the number of patient consultations for HIV and syphilis prevention, prenatal care, and family planning between 2012 and September 2013. The coverage of services—including early detection of HIV and syphilis, family planning (particularly for HIV-positive women), and access to prenatal care for HIV-positive women—has risen in many regions. Increasing coverage of HIV services at the primary level results in improved coverage up the chain, with more HIV-positive individuals being referred for treatment and contraceptive options and more HIV-positive pregnant women and their babies cared for, to further the goal of an AIDS-free generation. For Alfredo, the best part of his job “is when I see a patient who’s in poor health and later when he comes [back] to us, we can see how he’s been strengthened and recuperated.” He shares his thoughts in this one-minute video. Photo by Alex Collins.This blog post was originally published on the CapacityPlus blog.